My family has been watching the peril in Japan unfold and a lot of unnerving images have blinked before our eyes. It's hard for me- even harder for the boys to understand the magnitude of destruction. We can't fathom so much water sweeping in and washing away homes, lives, and futures. Out here in Nebraska, there aren't many puddles similar to an ocean. We do have a few large lakes or reservoirs, but a cattle pond is sometimes the largest body of water in a 50 mile radius. I have seen the ocean, but my children haven't. 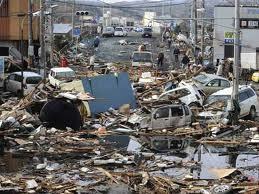 Like so many people, I am shocked and awed by Mother Nature's rampage in Japan. My Facebook page is loaded with different reactions from people all across the United States. There are the religious ones are proclaiming the end of times, there are people calling for help and aid, and we have an occasional post asking people to help at home before Japan. It's amazing the different ways people interpret these events. Solemn and depressing news constantly escapes from Japan onto our media. It's similar to Hurricane Katrina, September 11th, and other disasters in recent history. However, tonight I stumbled upon a glimmer of hope. A story about the recoveries of a 4 month old baby, a 70 year old woman, and a man clinging to his roof 10 miles out from sea. I am so thankful for some good news and I've attached a link to the story. I could add a lot of comments or opinions, but I won't. I'll let it be what it is and pray. Hopefully, we will find more hope in the next few days for the people of Japan. I do accept guest posts that meet high standards. If you have an idea or activity you want to share, please shoot me an email with some details.